Google has made both headline writers and Chrome OS fans deliriously happy by finally unveiling the touchscreen Chromebook Pixel. We won't suggest that this is Pixel perfect, but the 2560 x 1700 device certainly takes the burgeoning Chrome OS to a new level – adding touch to the mix while giving it the highest resolution to ship on a laptop to date. "I'm pretty sure every laptop will be touch in the future – so we wanted to push that forward," Google SVP Sundar Pichai said during a hush-hush event today, signaling that this isn't just a romp in the PC park for Google. The firm means business with this 'book, which will come in both Wi-Fi and LTE models – it's packed the Pixel with a lovely touch capable screen, solid insides and the rapidly expanding Chrome OS into an anodized aluminum bodied machine. And though it's priced princelier than some of chief competitor's products, Google is clearly taking aim at Apple's MacBook line, and we think it stands a fighting chance. This is Google's project all the way, completely designed and built by the crack G-team. 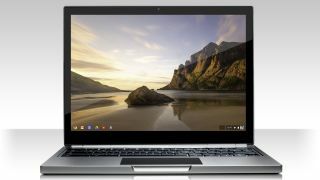 Using Cr-48 as a reference, Google flushed out, built and finished its notebook aspirations with Pixel. Google is billing Pixel as a high-end premium product, and its inner and outer workings speak volumes about that marking. The Gorilla Glass screen is where the bragging rights begin – its aspect ratio is 3:2 and with a pixel density of 239ppi, it's home to 19 more pixels per inch than the MacBook Pro with Retina. The display stretches to 12.85 inches, larger than other 11.6- and 12.1-inch Chromebooks made in tandem with various partners. It needs that extra space to pack in the Chromebook's 4.3 million pixels. As if there isn't enough about the display already, specs for the screen also mark it as 400 nit with a 178-degree extra-wide viewing angle. Powered by a dual-core 1.8GHz Intel Core i5 processor, the laptop's battery snags more than five hours of life. RAM sits at 4GB, while solid state drive mojo is 32GB for Wi-Fi only and 64GB for the LTE model. Intel is also providing the graphics power with an integrated Intel HD Graphics 4000 card. There's the expected backlit keyboard and a fully clickable, etched-glass touchpad. Google has gone for a seamless exterior – rounded edges, vents are stashed away, screws invisible and stereo speakers are tucked beneath the keyboard. Two microphones near the camera create a surrounding sound cancellation effect, and a third microphone under the keyboard adds further noise-muffling powers. Combine the microphones with a 720p webcam and you can make some decent home movies. There are two USB 2.0 ports, a mini-display port and two-in-one card reader supporting SD and MMC. All told, the machine weighs in at 3.35 pounds. Google didn't skimp on some niceties either: The hinge is of a luxury build (for smooth opening) and for those who can't stand the whir of their laptop fan, it's tuned to mute as much buzz as possible. Google's made full use of its recent acquisition of QuickOffice, as Pixel will open Excel natively in the browser and allow it to work offline. Photography, something apparently very dear to the Google+ employees who've been tinkering with Pixel, as moved Google to provide quick, high-quality uploads in the laptop. To that end, Google said it's developing an app that will let users automatically upload, view and share photos. The app is expected soon, and will let start the upload process as soon as an SD card is inserted into Pixel. After transfer, Pixel will put those pics to Google+ directly. But, how to store all these pics? Google's seemingly thought of everything as it's bundled 1TB of Google Drive data for three years.